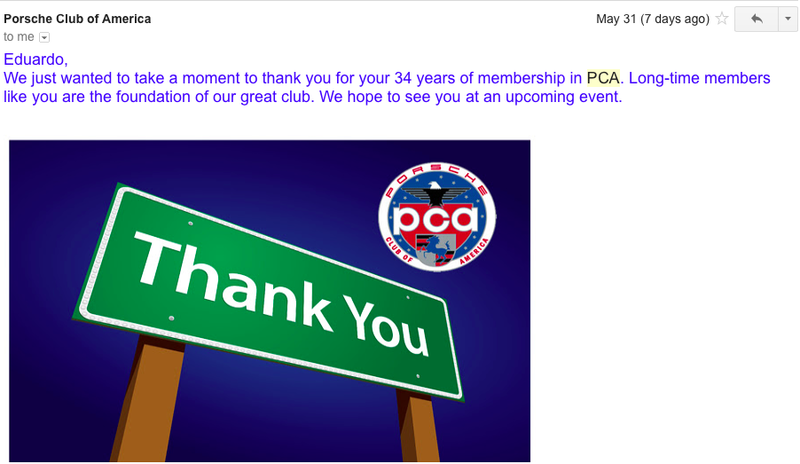 do most of you have a PCA membership? if so, does it provide any benefit? if i am missing an obvious sticky or previous thread, please feel free to link me up. did a quick search, but i did not find anything of interest. Each chapter has it's own personality. Attend a meeting and decide for yourself. Join, put the PCA sticker in your windsheild, read the monthly magazine in your bathroom and keep your eyes open for a PCA track day or car show for something to do. Many dealerships (mine included) offer a 10% discount on parts and service to PCA members. That more than pays for the annual membership. My PCA group is heavily involved in autocross and track events, as well as breakfasts, dinners, driving tours, concours, and more. Member since '93. Been active in DE, racing, autocross, primarily. It is a good venue for those things, imo. Most PCA regions allow you to participate in driving events in a Porsche even if you aren't a member but PCA membership is required if you want to run a different make of car. I'm not much into the social aspects but the monthly club magazine is great and getting even better now under direction of Pete Stout. And, as has been mentioned, there are the 10% discounts on parts and service from most dealers which can quickly pay for the annual $46 membership fee. I've been a member for 30 years....you should join. Been a member since 84. The 10% discount on parts has more than paid for all of my membership costs. My region, OVR, has a pretty well attended and fun monthly meeting. I try to attend as often as possible. Last edited by tomc_mets; 06-07-2015 at 10:22 PM. Been a member since 76.
pete stout, editor of PCA's magazine panarama is member here. he made the mag really good. that alone is worth it. joining PCA becomes a no-brainer. With Club discounts available from most dealers, it becomes financially counter-productive NOT to join.